Notepad is a simple text editor that allows you to save different types of code in different file formats. That is not all, this Windows program can be used to make a lot of other small programs that wipe a hard drive or even forcefully shutdown another computer. The same software can be used to test the powers of an anti-virus and more. These notepad tricks below are just a few of the many other you can do with your notepad. Yes, it is as easy as typing the following code on your notepad and saving it as a .VBS file. The impact is that the CD drive will pop out continuously after you run the file. 4. Now, open cdopen.vbs and it will start the process to continuously open and close CD drive. 5. To stop the process, open Task Manager by pressing Alt+Ctrl+Del and stop cdopen.vbs process. The best thing is that all the code is simple to copy paste to the notepad in case you want to make any changes. To get that cool matrix effect we’ve seen in the movie, open notepad and paste the code given below. Save the file with anyname.bat extension. If you think you have known great things, you should try this one. Shutting down another person’s computer remotely. Furthermore, you can decide to even add messages that will show up before a computer shuts down. This tactic is very cool if you want to appear like a geek. Simply type the following code on your notepad and save it as a .bat file. 2. Paste @echo off in first line. 3. Paste msg * Shutdown computer in second line. 6. Click on your file and it will automatically shutdown your Windows. Have you ever wondered people get to know whether the anti-virus program is working? Notepad tricks are here to the rescue. It is a simple procedure, you just have to type the following line of code and your anti-virus will attempt to delete. Otherwise, the anti-virus is not working, as it should. Remember to save the program as an .exe file. If you want your computer to read you any text, you can enjoy that using the notepad tricks. This is what you have to do, type the given code below in your notepad and save as a .vbs file and you are good to go. 4. Click the file and your all three LED lights will start dancing. 5. To stop, Shut down or Log off your PC. If you want to wipe data from your hard drive, it is as simple as using multiple ones and zeros. The above code should be saved as a .exe file to work appropriately. However, make sure you back up your data before trying anything. That you will still have what you want after the hard drive is formatted. 2. Save it as “Anyname.txt”. After you can open the file again, you will note the current date and time has being inserted automatically after the LOG line, and that will happen every time you reopen the notepad file. 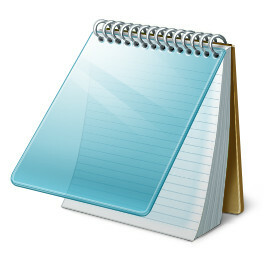 Now that you know a number of cool notepad tricks, you can teach or make fun of your friends using notepad. The programs are not to be used for bad purposes however, enjoy!